Forget Black Friday, Cyber Monday and any other day inbetween for that matter. Facial recognition technology installed into Ocean’s large format digital screen on the main approach to Westfield London proves that men really do leave their Christmas shopping to the very last possible moment. Unique camera technology that differentiates between genders captures, in glorious, full motion, the last minute surge of male shoppers arriving at Westfield London between 3pm and 4pm on Christmas Eve, searching for those last minute gifts. Access to this kind of real time data allows brands to prepare and serve bespoke messages aimed at male shoppers who are anxious to buy the perfect gift hours before the shops finally close for the holiday. 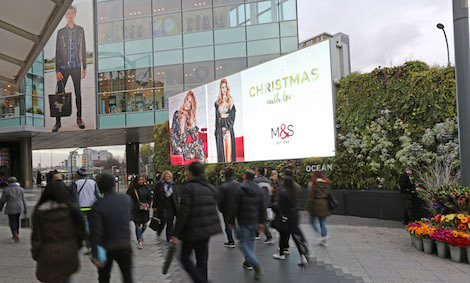 Ocean’s revolutionary ad technology has been now installed across more than 80 other digital screens in London, Birmingham, Manchester and Newcastle, allowing retailers and brands to take the stress out of the desperate dash on Saturday, December 24 by serving a flow of perfect gift ideas. The top 10 ads playing out on the run up to the crucial Christmas Eve shopping window are for handbags, perfume, jewellery, watches, lingerie, toys and games, confectionary, clothing, cosmetics, booze and games. This entry was posted on Monday, December 5th, 2016 at 11:54 @537 and is filed under DailyDOOH Update. You can follow any responses to this entry through the RSS 2.0 feed. You can leave a response, or trackback from your own site.